Thankfully the biker was not injured in the incident. The frightening moment a motorcyclist narrowly escaped being buried under a lorry carrying stones and sand has been caught on camera. The video, shared by CGTN on Twitter, has left many on the micro-blogging site shocked. The incident took place in Zhaotong City, South West China on January 16. The clip, just 42 seconds, shows the biker and the lorry heading towards an intersection. The truck, while taking a turn, loses its balance and overturns even as it continues to swerve forward. The motorcyclist, seen riding right next to the truck, watches the truck flip right next to him. 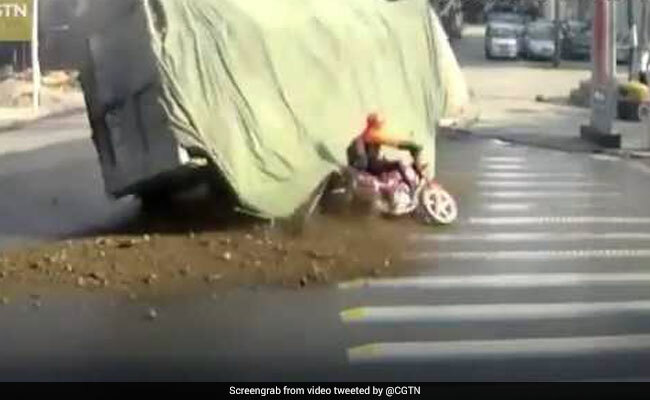 The lorry crashes on the road but the biker is saved from being buried under the sand and stones thanks to the tarpaulin covering the top of the lorry. The impact sends the biker skidding on the road. "Well that was freaking lucky. Motorcyclists are easily squashed," says one Twitter user. "Second life," says another.